Paediatric cancer specialist Prof David Walker’s work is a bittersweet affair. At times he is able to deliver the happiest of news to parents: that he and his team have saved the life of their child. Equally, he is the one who has to tell a fearful mother and father that there’s nothing more he can do, that their son or daughter’s cancer has spread beyond the reach of his drugs and the surgeon’s knife, and that their child will die. Based at Nottingham University for the past 22 years, working at Nottingham Children’s Hospital and Nottingham Medical School, Prof Walker combines a passionate commitment to the welfare of his patients with a deep respect for scientific discipline. He wants to see more and better therapies added to the armoury of paediatric cancer treatments, to save the lives of more children, and is frustrated by the obstacles that block the path to new cures for cancers. Medical science decrees that no new treatment should be used until it has been thoroughly tested in randomised clinical trials. Trials are the gold standard, Prof Walker stresses, and where possible patients should be in a trial if one is available. “Research does require regulation to introduce new drugs and treatment safely,” he says. Around one in 600 children under 16 are diagnosed with cancers. The most common, such as leukaemia, account for a third of cases, and treatment success rates are high. But some are hard to treat, other than with surgery, such as the highly malignant rhabdoid tumours, which start in the kidney. There are no standard therapies for these cancers and less than one in five children diagnosed with a stage III or IV rhabdoid tumour will survive beyond four years. With such rare childhood cancers, it is hard to gather enough patients to form a trial in one country alone, and these have to be organised internationally. So, while potential new drugs may exist, they cannot be used. “A drug may be available, the scientific rationale for its use may exist, but patients cannot receive it if no trial has been organised to assess its effectiveness and toxicity,” says Prof Walker. He also points out that the “big four” cancers – breast, bowel, lung and prostate – dominate media coverage as well as fundraising, research and trials. Researchers want to work on the common cancers because their research will be better funded, while drugs companies are more interested in this area as there is a bigger market, and a greater potential profit. If you have a less common cancer – and there are hundreds – your chances of getting on a trial are limited and the chances of there being innovative treatments are, in many cases, zero. Yet taken together, less common cancers – defined as a cancer that affects five people or fewer in 10,000 – account for more than half of all British cancer deaths. One in six of us will develop and die from a rare cancer. The lack of trials in this area means doctors who want to cure their patients, rather than just manage their deaths, are caught in a scientific circular argument. There is no evidence that a new treatment will work, so it cannot be used to find out if it does work. Prof Walker believes that doctors should be able to try new treatments with such patients on an individual basis. Yet, he argues, the law, and the culture of defensive medicine which surrounds it, stands in the way of innovation. Doctors are protected if they stick to the well-worn path of “standard procedure” even if it leads to the death of the patient. But they may be vulnerable to legal action if they try something new and it fails. Which is why Prof Walker supports Maurice Saatchi’s Medical Innovation Bill, currently going through a public consultation process by the Department of Health, which ends later this month. It seeks to provide legal protection for doctors who innovate in the interests of their patients. He argues that when patients are terminally ill and there is no trial for which they are eligible, a doctor should be free to innovate. “We need to allow them to try new drugs outside of a formal trial and collect the data from those innovations to inform the next generation of trials,” he says. “The Saatchi Bill would protect individual doctors who try new, untrialled treatments, where there is a scientific rationale for their use, in patients who consent. 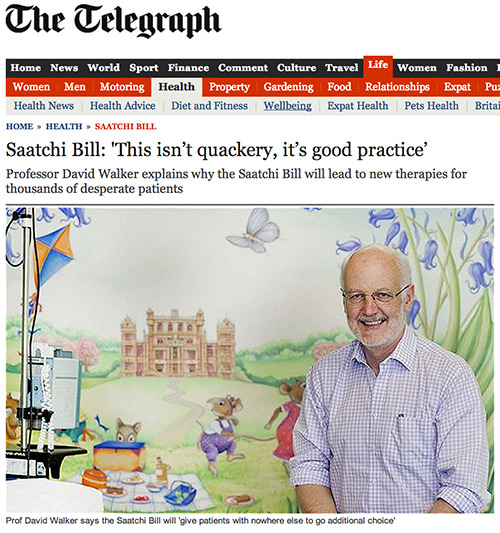 The Saatchi Bill, he believes “will give the patients and their families additional choice and allow doctors to try new medicines in people who have nowhere else to go, and do it in such a way as we could all learn from it”. Prof Walker also believes that even when an individual patient cannot be cured, this kind of innovation will advance medical science for future patients. He also explains that many cancer drug trials rightly focus hard on a tightly defined group of patients with the same tumour type, which has within it a particular cancer molecule, that the drug being tested is designed to block. The new drug may work in another rarer cancer with the same molecular target, he says. “But if I have a patient with a very rare cancer with the same molecular target, I can’t use it. Current rules require us to set up another trial in that tumour, and that’s expensive and requires collaboration with the drug industry, which may not wish to supply the drug for such a purpose if they don’t think it is commercially advantageous. So, in the meantime, the hospital won’t release that licensed drug for an unlicensed purpose because there’s no evidence that it works,” he says. This is where the Lord Saatchi’s Medical Innovation Bill would help, he argues. Opponents of the Bill argue that a law that supports doctors who want to try new treatments outside the trial process is a “quack’s charter”.